woh! these are the perfect lowitz, lowitz 46deg contacts arc are even clearly present below cza! is there any other picture of the cza/contact arcs area?? 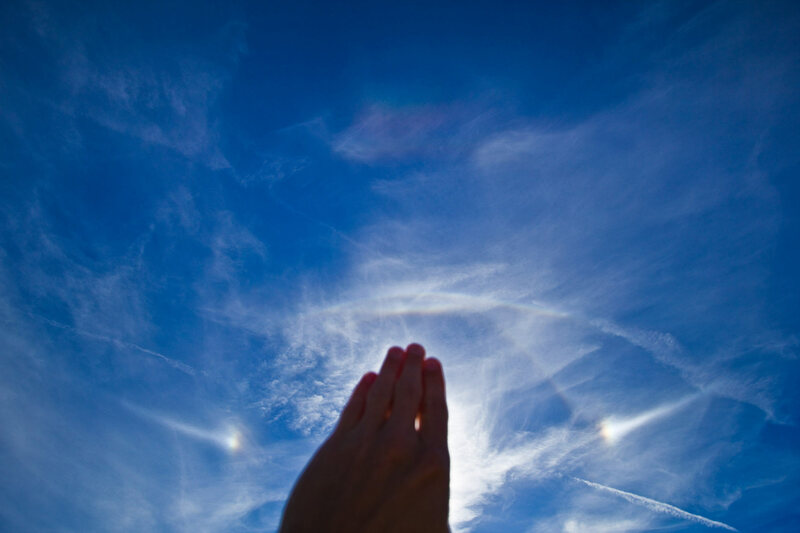 it reminds me of what i got in normandy in 1998, little 22deg halo, but strong UTA, parry suncave and lowitz crossing together! Wau! Nice catch! The Parry-Lowitz is incredible. Congratulations, Mike! The upper tangent arc is quite strong as well, so I'd vote for a supralateral arc below cza. But who knows. if it was supralateral it should be tangent to cza, while it is clearly separated. and i don't believe in 46deg halo, so it must be 46deg lowitz contact arc, which is really extraordinary! THAT IS AWESOME!!!! This shows you don't always need diamond dust. Thats a superb display love the lowitz arc a lot!!! Hope more of these keep coming I got wegener arc this week. Nicolas, you're right - it is separated. I didn't look carefully enough while writing the comment. Anyway, such a sight is typical and is most likely due to tilting plates. But as well it could arise from Lowitz orientation, sure. 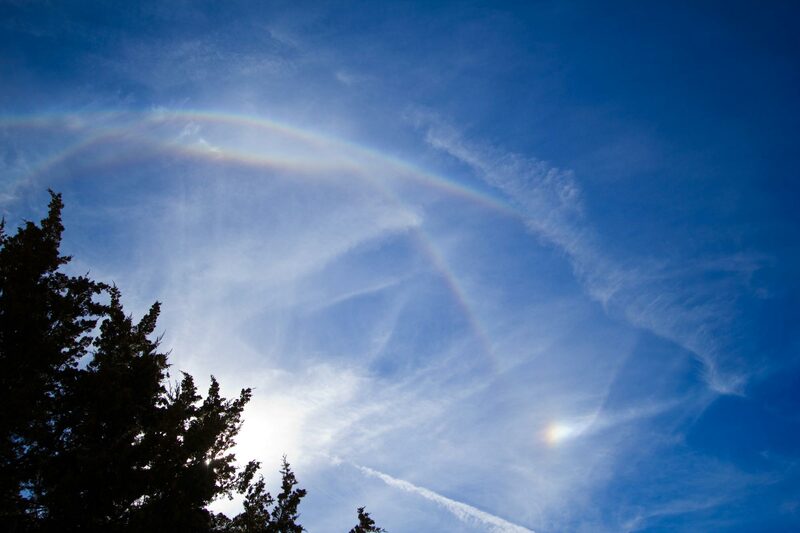 With such a short piece of arc, however, it is difficult to make a definite identification of 46 contact arcs. This is grazy display. Has anyone made simulations of the 46 halo / contact arc issue? 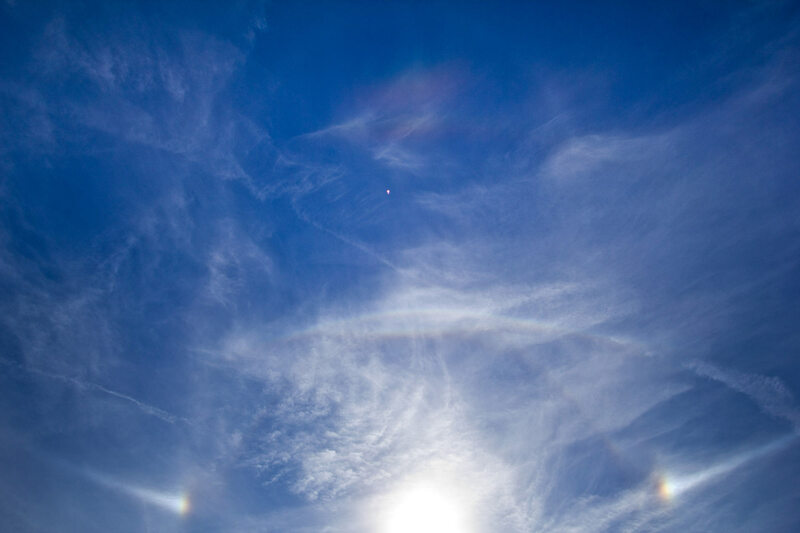 Most of what I got is on the site on this page, labeled with help from Marko and Ágnes....as well as Les... http://www.extremeinstability.com/2010-11-7.htm I hope the 46 degree halo is right as I don't want to change labels again lol. I knew better than to mess with the page for it until I had a handle on the names but I never listen to myself. Wow!! Those are very bright lowitz arcs! That's a very great display. 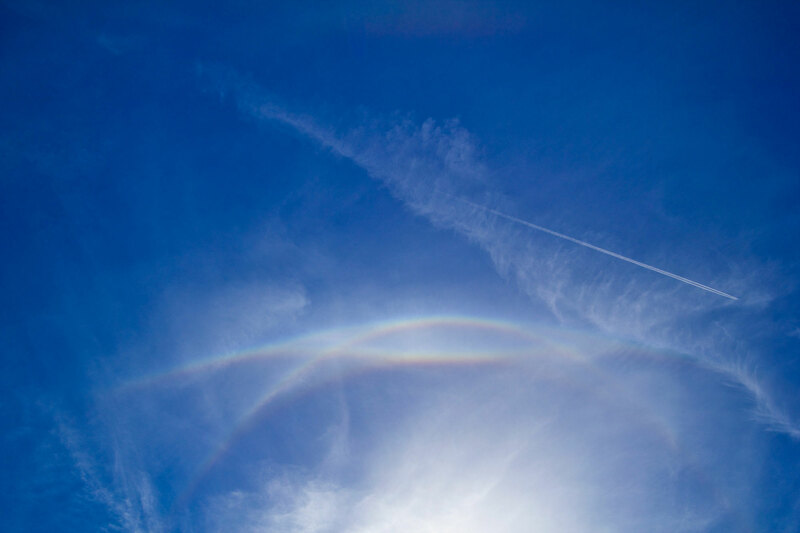 I can't really say the arc below the circumzenithal arc is not a part of the 46 degree contact arcs, but I'm pretty sure it is mostly a 46 degree halo. In the first picture, the arc faintly extends down toward the parhelic circle. There are intensity variations near the top which could be contact arcs. all the 46deg arcs are contact arcs. That simulation matches the intensities of the halo and the appearance of it very well, Nicolas. I wouldn't have a hard time believing they are 46 degree contact arcs. I think, here is Hastings arc too. Use unsharp mask to image "1mike". 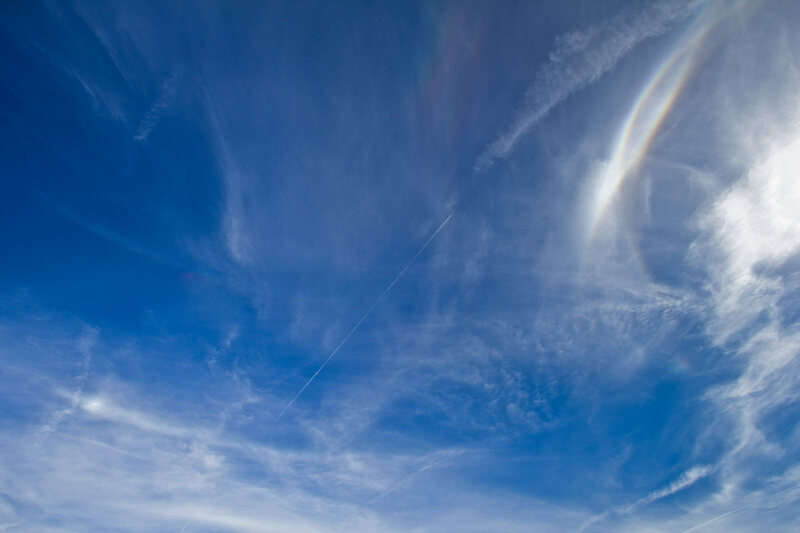 ok, i am now more or less convinced that it is actually mostly 46deg halo! marko's simulation shows well that you can get a relatively well visible 46deg halo while 22deg is weak. The patch under the cza in the simulation is made both of 46 contact arc and 46 halo, the former from so called Parry-Lowitz orientation, where the equilibrum position of the crystal is basal faces vertical and the latter from poorly oriented plates. The 46 halo rays dominate in simulation. Simulations aside, because in the photo there is no charasterictic sunvex shape of the upper 46 contact arc, I'd rather see it as 46 halo. 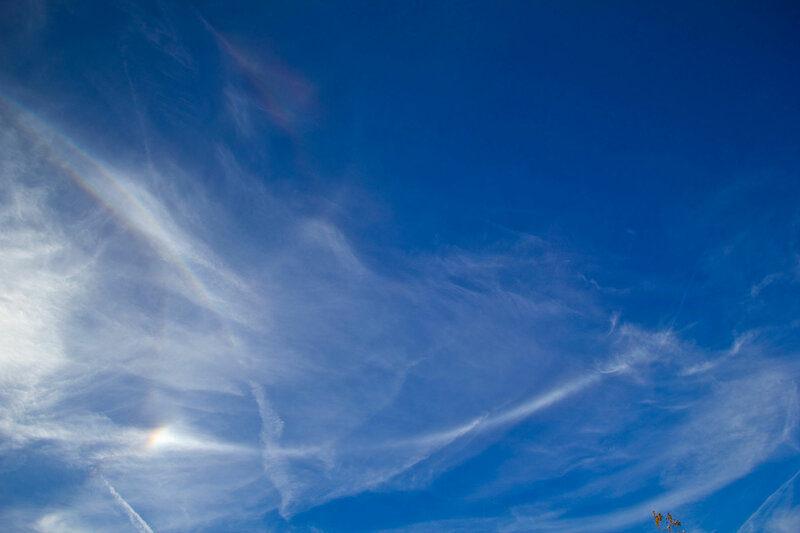 In general, Parry and Lowitz crystal areas in high clouds are usually small in extent, we hardly ever see simultaneously Parry arcs and Tape arcs as we do in diamond dust. In Mike's display it is possible that the best Lowitz crystals did not span simultaneously the 22 and 46 region. Good point Patrik. I don't see the Hastings / Wegener separation that appears in Nicolas's simulation closer to the sun. But H and W overlap where the arc shows in the photo, so probably the arc is a combination of both. That is a great display! That Lowitz-Parry compination is a killer! I think we should see some outward curvature or other components of 46 contact arcs if we want to identify that 46 degree stuff as 46 contact arc. As Marko point out, it probably has both ray paths. These "top bright 46d halos" are not uncommon. Many older cases has been lacking clear Lowitz arcs. This Hollingshead's display is such a milestone that it should be become christened by its location, like "Saskatoon" or "Kuusankoski". Where this was seen, more exactly? I know I have gotten Parry Lowitz combo but nothing like that though. In 2004 I got all 3 lowitz arcs and I think two years ago I got both parrys at once.